Beginning with the construction of the resort hotel, the Catskill Mountain House, at Pine Orchard in 1824 and Thomas Cole's historic journey up the Hudson the following year, the Catskill mountains in upstate New York were opened to tourists and artists. The painters not only celebrated the newly-discovered scenery in their canvases, but were instrumental in blazing the trails to reach the various areas of beauty. John F. Kensett and John W. Casilear painted at Haines Falls and Kaaterskill Clove in the Catskills in the summer of 1849; yet as one writer noted, part of their time was spent building ladders and constructing paths "by which that portentous gorge was rendered easy of assess." Kensett returned to the area in 1851 with the writer, George W. Curtis. Curtis' travel book, Lotus-Eating: A Summer Book, illustrated by Kensett, was published the following year further popularising the area for vacationers. Curtis noted how closely the style of Kensett was identified with the area: "a broad bit of mossed rock, or a shapely stretch of trees with the mountain outline beyond" would recall "the poetic accuracy and characteristic subjects of that artist" and be designated "a Kensett." Trout Fisherman was probably taken from one of the artist's sketches made at this time. Fellow artist, Benjamin Champney, who often accompanied Kensett on his sketching trips also noticed the distinctive quality of Kensett's woodland interiors. The brilliant studies he brought back from the Catskills, Champney noted, "were marvels of clever handling and colour. No one seemed able to give the sparkle of sunlight through the depths of the forest, touching on mossy rocks and shaggy tree-trunks so well as he. These silvery studies were painted with conscientious care, but also with a poetic free translation of what he felt, for he had a true poetic feeling." The composition for Trout Fisherman was, however, also influenced by Asher B. Durand. 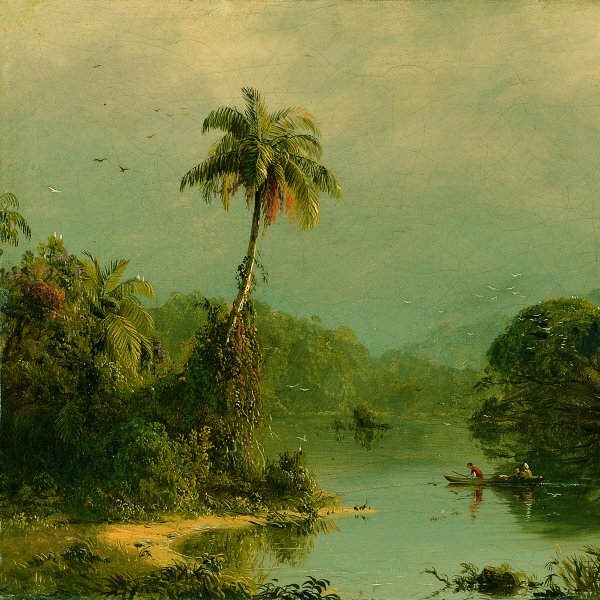 The two artists had travelled together in Europe, and in 1849 and 1850 they had sketched together in upstate New York. Kensett not only adopted Durand's vertical format for his landscape with the trees forming a cathedral-like arch, but used the birch, a hallmark in Durand's woodland scenes, as the prominent tree in his foreground. Trout fishing was a popular theme in American art at mid century in both prints and the fine arts. It was the subject of numerous lithographs by Currier & Ives, including The Trout Stream, drawn by the firm's leading artist, Frances F. Palmer, which was issued the same year as Kensett's painting and shows fishing in the Catskills. Worthington Whittredge also followed Kensett in painting a number of canvases portraying a trout brook in the Catskills. The trout stream and fisherman were included in the landscapes of the 19th-century painter from Thomas Doughty to George Inness and Winslow Homer. 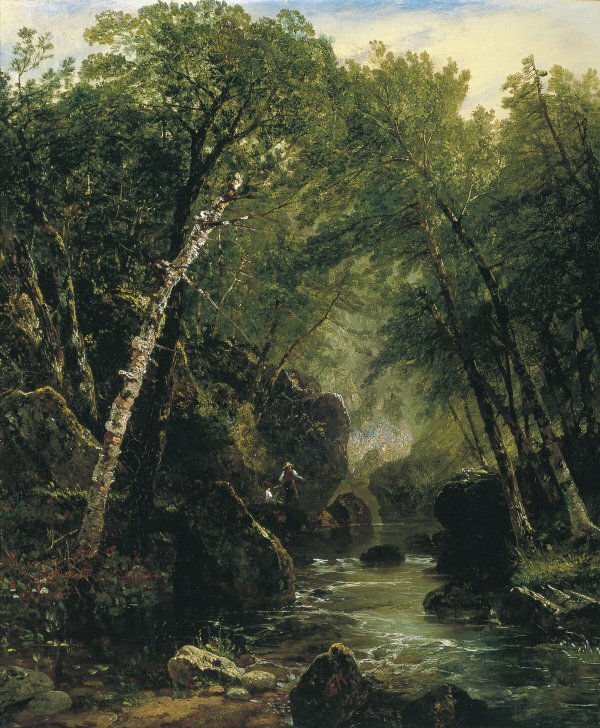 Kensett, himself, painted several other versions of the subject, including Trout Stream and Landscape, which may be this painting, that was sold late in 1852 to Peter A. Porter for $100.